IMWG guidelines  recommend that sFLCs are measured at baseline for all SMM patients to allow risk stratification (Section 25.3.2) . A number of studies that demonstrate the prognostic utility of sFLC measurements in SMM are described below, but it should be noted that many predate the 2014 revisions to diagnostic criteria, which reclassify high risk SMM patients as MM patients requiring treatment (Section 25.2.1) . The largest study to assess risk factors for SMM in the context of the 2014 diagnostic criteria was reported by Lakshman et al. , and included 421 SMM patients followed up for a median of 74.8 months. At diagnosis, a number of variables were assessed as potential prognostic markers to predict malignant progression, and ROC analysis was performed to identify the optimal cut-offs. The variables included M-protein size and type, the proportion of BMPCs, involved/uninvolved sFLC ratio and the presence of immunoparesis. On univariate analysis, only the M-protein size (>20 g/L), proportion of bone marrow plasma cells (BMPC >20%) and the involved/uninvolved FLC ratio (>20) were significantly associated with progression, and the same three variables remained prognostic on multivariate analysis. Combining these risk factors, Lakshman et al. developed a risk stratification model that divided patients into three groups: low-risk (no risk factors), intermediate risk (1 risk factor) and high risk (2 or 3 risk factors). The estimated median time to progression for the low-, intermediate- and high-risk groups were 110, 68 and 29 months respectively (p<0.0001). The authors conclude that high-risk patients may benefit from clinical trials of early intervention to prevent/delay progression to MM or AL amyloidosis. Similar risk factors were reported by Akhlaghi et al. , although the design of this study was not identical to the one described above, as the definition of SMM was based on the IMWG criteria at the time of diagnosis, which ranged between the year 2000 and 2017. The use of sFLCs as prognostic markers in SMM spans over a decade. The initial observations were reported by Augustson et al. who studied SMM patients recruited to UK MRC MM trials, and their findings were subsequently confirmed by others , including two notable large studies reported by Dispenzieri et al. and Larsen et al. . Dispenzieri et al. studied the prognostic value of sFLCs in 273 SMM patients attending the Mayo clinic, Rochester, USA. After a median follow-up of 12.4 years, transformation to active disease had occurred in 59% of patients. The authors noted that patients with more extreme sFLC ratios had a higher risk of progression to active MM than patients with normal or near normal values (Figure 14.1), and the prognostic value of the sFLC ratio persisted after adjusting for competing causes of death. In the study by Larsen et al. , baseline sFLC results were analysed retrospectively in 586 patients with newly diagnosed SMM. The κ/λ sFLC ratio was abnormal in 74% of patients. Receiver Operating Characteristic (ROC) analysis identified the optimal diagnostic cut-off for the sFLC ratio to identify patients at highest risk of progression to symptomatic disease within 2 years of diagnosis. A serum involved/uninvolved sFLC ratio ≥100 was used to define high-risk SMM (now considered one of the diagnostic criteria for MM; Section 25.2.1), and included 15% of the total cohort. This resulted in a specificity of 97% and a sensitivity of 16%. 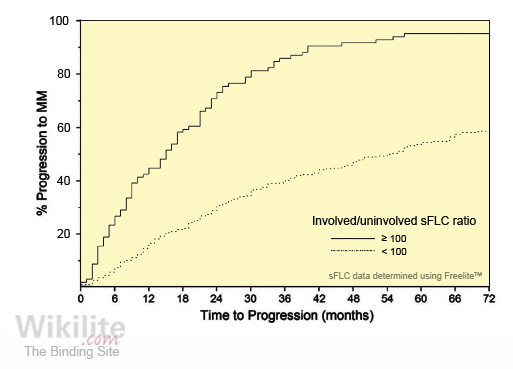 The risk of progression to MM within 2 years of diagnosis was 72% for SMM patients with an involved/uninvolved sFLC ratio ≥100 (Figure 14.2). This risk increased to 79% when progression to AL amyloidosis was included as an endpoint in addition to MM. In univariate analysis, BMPC content, serum monoclonal protein concentration and involved/uninvolved sFLC ratio ≥100 were all significant prognostic factors, and all remained significant on multivariate analysis. The prognostic value of extreme sFLC ratios (≥100) for progression from SMM was confirmed by two subsequent studies . Kastritis et al. also identified extensive bone marrow infiltration (BMPCs ≥60%) as an additional risk factor. Both risk factors (extreme sFLC ratios, and BMPCs ≥60%) are now included in the revised definition of MM (Section 25.2.1) . Why abnormal κ/λ sFLC ratios should predict a worse outcome in SMM is still unclear, but the authors speculated that these patients might have immunoglobulin heavy chain translocations or other genetic disruptions associated with disease progression . Moreau et al. compared the performance of Freelite polyclonal antisera-based assays and N Latex FLC monoclonal antibody-based assays. 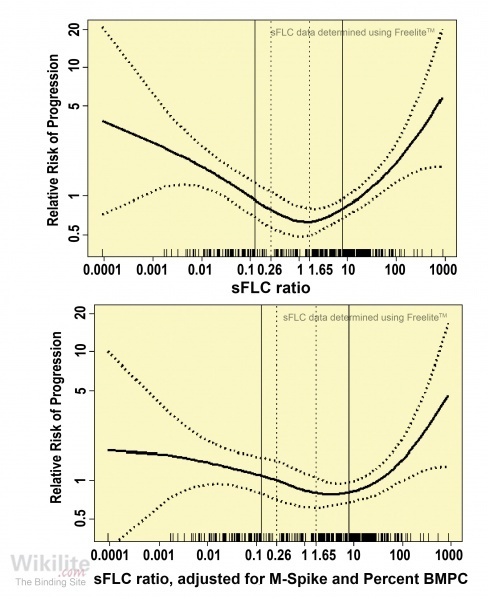 The authors concluded that the two assays are not interchangeable, and that cut-offs based on Freelite assays for SMM risk stratification cannot be applied to N Latex FLC assays. This is further discussed in Section 8.6. Hevylite assays allow the measurement of isotype-specific suppression of the uninvolved HLC-pair (i.e. suppression of IgGλ in an IgGκ patient) (Section 11.2). As HLC-pair suppression has been identified as an adverse prognostic marker in MM and MGUS patients (Chapters 13 and 20), it may also have prognostic significance in SMM. In the largest prospective study of HLC and SMM published to date, HLC-pair suppression was observed in 39/50 (78%) patients at diagnosis, compared with 32/50 (64%) patients who had conventional immunoparesis, i.e. suppression of uninvolved polyclonal immunoglobulins . Of the 18 patients without immunoparesis, HLC-pair suppression was present in 8/18 cases and was associated with adverse biological features such as more skewed κ/λ sFLC ratios and a more pronounced distribution of abnormal/normal plasma cells. Isola et al. prospectively monitored 18 patients with SMM. Highly abnormal HLC ratios (<0.02 or >45) and severe HLC suppression (>50% below lower level of normal) were found in 44% (8/18) and 55% (10/18) patients at diagnosis, and both features were present in all three patients who progressed to symptomatic disease during follow-up. In an initial investigation by Maisnar et al. , HLC-pair suppression was associated with increased risk of progression in IgG (n=51, p=0.006) but not IgA (n=20) SMM, although patient numbers were small. Further studies are now required to confirm the prognostic significance of HLC-pair suppression in SMM.